With Pope Paul V (Camillo Borghese, pope from 1605 to 1621) and his nephew Cardinal Scipione, this family of Siena became one of the most important in the history of Rome. The family survives to these days. 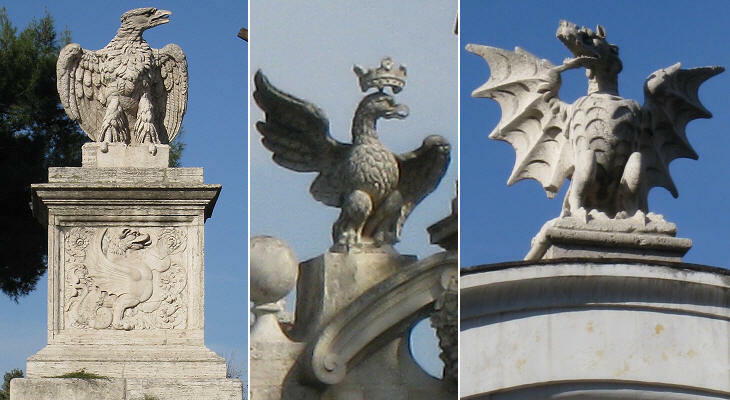 Their heraldic symbol is based on the dragon (like that of Pope Gregory XIII of the Boncompagni family) and on the eagle with the latter above the former. This large Villa (see the plate by Giuseppe Vasi) was immediately outside the walls of Rome, from Porta del Popolo to Porta Pinciana. Dragons and eagles are everywhere in the large park. The Borghese however normally lived in their city palace. Here they had hanging gardens overlooking the river and large offices for their staff and the administration of the numerous possessions the family had around Rome. Several other nearby palaces were also belonged to the family and were used for ancillary purposes. Because of its shape this palace is called "Il Cembalo" (the Harpsichord). A winter garden overlooked Porto di Ripetta. In this Palace Cardinal Scipione and his successors assembled a very impressive collection of statues and paintings, which survived the era of Napoleon because of the marriage of Prince Camillo Borghese with Paolina, Napoleon's sister. 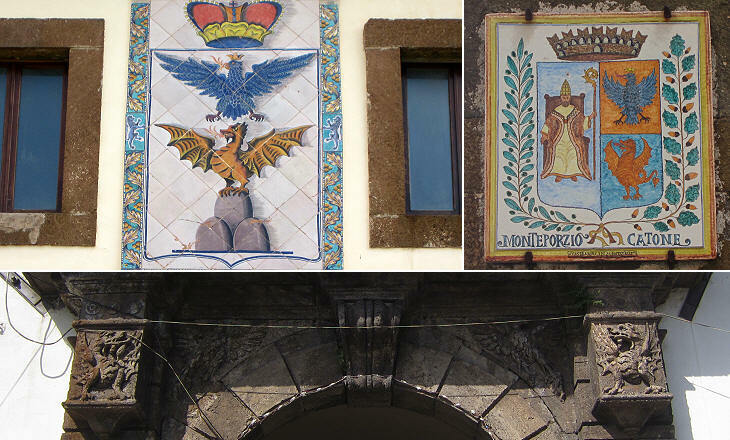 See the coat of arms on the fa�ade of the palace in the plate by Filippo Juvarra. Pope Paul V inherited the Basilica almost completed, but hidden by part of the old Basilica. New St Peter's (map1 1/B2) in addition was based on a Greek cross, which was not in line with Catholic liturgical needs. He decided therefore to lengthen the eastern wing to give the church the traditional Latin cross shape. In doing so he destroyed the fa�ade of the old Basilica and built a new one. 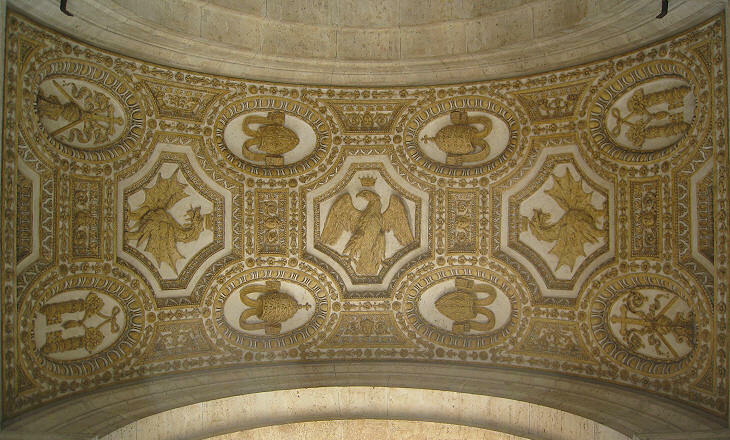 The ceiling of the portico at the entrance reminds the visitor that this part of the church was built by Paul V.
Paul V's tomb is in S. Maria Maggiore in Cappella Paolina but also the doors of the sacristy and a well in the courtyard pay homage to the heraldic symbols of the pope. Signs of Paul V are very often not immediately noticeable. Here the fountain of the Acqua Paola (map3 36/B5) on the Gianicolo Hill (at that time called Montoro=Golden mountain) is surrounded by small piers with dragons and eagles. By bringing to the western side of Rome water from the Lake of Bracciano (building upon a previous Roman aqueduct) Paul V brought water to the Vatican and because of the high level of the aqueduct many fountains were built around St. Peter's and in the gardens. Many churches were built by Cardinal Scipione Borghese and in general one can say that under the Borghese Rome became the artistic center of Italy. One of the favourite architects of Cardinal Scipione was Giovan Battista Soria who designed for the cardinal the fa�ades of three churches: his masterpiece is S. Gregorio al Celio (map4 20/F6). The Celio hill was almost abandoned in the XVIIth century, although it had been flourishing in Roman times. 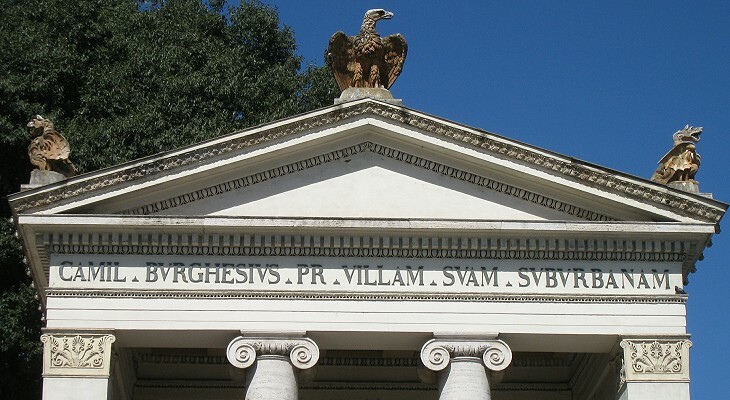 The symbols of the Borghese were very apt to be artistically interpreted to decorate the fa�ade of a church. S. Crisogono (map3 18/D5) is in Trastevere, again an area then of little interest, which the Borghese developed by the construction of the aqueduct of Acqua Paola. 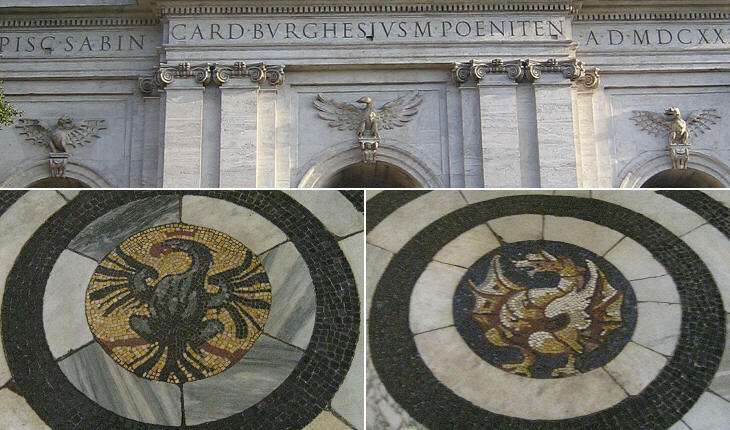 Eagles and Dragons are not only on the fa�ade, but also inserted in a XIIIth century Cosmatesque pavement. A third fa�ade by G. B. Soria for Cardinal Borghese is in S. Teresa della Vittoria. G. B. Soria is also the architect of S. Carlo ai Catinari. South of Rome lies an area of vulcanic hills, the Colli Albani. With the Borghese this area became the preferred countryside of Rome, replacing the area to the north of Rome towards the lakes of Bracciano and Bolsena. Twelve little towns rapidly developed and were called I Castelli Romani (the Roman Castles). 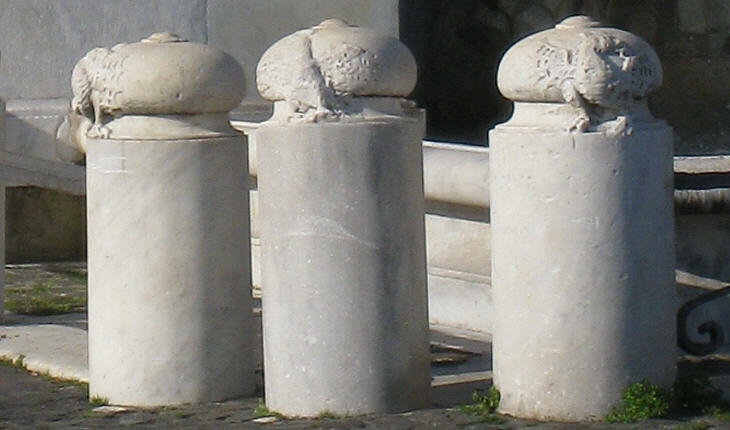 Two of these, Monte Porzio Catone and Monte Compatri retain on their coats of arms the symbols of the Borghese family. The entrance to Monte Porzio Catone is the entrance to yet another palace of the Borghese and below the balcony the eagle and the dragon keep an eye on who is coming in. See also magnificent Palais de la Monnaie in Avignon and the Quirinale Palace in Rome.